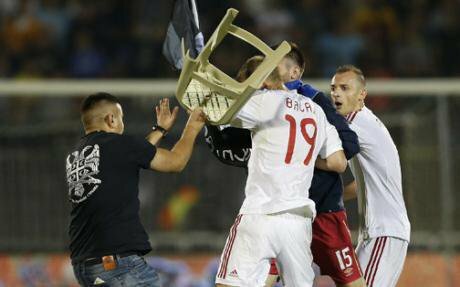 An Albanian player is attacked by a Serbian fan during the abandoned football match on 14 October. Flickr/Nazionale Calcio. Some rights reserved. When Albania and Serbia were drawn in the same group for the Euro 2016 qualifiers, UEFA decided to persevere, despite the historical and recent tension in the region. Usually if the political situation is sensitive, the teams are drawn in separate groups or played in a third country. For example, due to conflict between Georgia and Russia, before the draw for World Cup 2014 qualifiers, these two countries were separated to play in different groups for political reasons. In the case of Albania and Serbia, UEFA decided not to keep the teams apart. One of the reasons was that Albania and Serbia have never been at war with each other. Hence, since they were never in a conflict then there was no reason to redraw the match. But let's look at the last war in Balkans - between Serbia and Kosovo. Albania as a state was not involved however the Kosovars and Albanians share the same nationality, with a majority of Kosovars also identifying as Albanian. The official Kosovo nationality has been, since 1999, "Kosovar" - a term introduced by UNMIK and taken over by the Ministry of Internal Affairs since 2008. Downplaying the relation of the Kosovo-Serbia tensions with Albania and the Albanian nationality, is an attempt to move forward. However it also plays a part in obfuscating the reasons of the war which were ethnically oriented between Kosovo Albanians and Serbs. Thus the first shortcoming can be the underassessment, by UEFA, of the regional political tensions in Balkans and the ignorance of the intrinsic relation between statehood and nationality in the triangle of Kosovo, Serbia and Albania, when proceeding with the match. However, they acknowledged that the political situation might be more tense than previously thought and, as such, opted for the match to take place under very special conditions. One of the conditions which played a significant role in the escalation is that football fans of the away country would not be allowed in the stadium of the home country. Thus Albanian fans would not be allowed in Belgrade’s stadium, nor the Serbian fans in Tirana’s stadium. This supposedly would create amenable conditions for a smooth match. However UEFA again got it wrong in believing the match could go ahead without trouble if the football fans of the away side were banned from travelling. In reality, this condition created a perception of unfair, discriminatory and unequal treatment of the Albanian football fans. The Albanian public was largely unaware that the same rule would apply also to the Serbian fans. The above condition was one of the incentives for the overreaction of the Albanian fans through flying in a drone with a Greater Albania flag over the stadium. Essentially the message was: you ban us in the stadium but we will still be there. Could this be seen another unfitting condition of UEFA? Yes, in cases of political sensitivity as high as in Balkans, spreading conditions that might easily be seen as discriminatory to one or the other group might revive old tensions quickly. Creating such a condition to balance the entertainment and security needs when the political tensions are so high only contributes to further escalation as shown by the match. Was the reaction to the drone being flown over the stadium to be expected? The reaction of the Serbian fans, security watchers and players [excluding few] to take the flag and verbally and physically attack the Albanian players was to be expected due to the amount of nationalism propagated by the state and inherited from the Kosovo wars. A recurring phase shouted in the match by fans was ‘kill, kill Albanians, until they all disappear’. A sudden change from highly nationalistic society to a non-nationalistic society has never occurred in our time. Keep in mind the match was taking place one and a half decades after the Balkan wars. In addition, the incapability of the security forces in the stadium to provide general security and especially for the Albanian team as they were the only one in danger was a big shortcoming. However even this is expected due to the nationalism and as well as the lax security preparations for the game. The reaction of Albanian players as well was to be expected, as football is not a usual game that they play in Serbia. This is much more than a game due to the specific political circumstances; hence the take over by a Serbian player of the flag immediately spurred a reaction by the Albanians players, interpreting it as a national offense. Thus political sensitivity and nationalistic feelings that played a role for reactions of both sides, and the above reactions (and even worse) were to be expected. On a positive note, the success of this story is that nobody was killed or severely injured. Now we turn to the reactions and the meaning of the match by the locals in Kosovo, Albania and Serbia, and among internationals. The Albanian’s territories, especially in Kosovo and Albania experienced the end of the game euphorically, feelings of happiness and triumph symbolized by the showing the flag over Serbian stadium. Many people went to celebrate in streets, drinking, singing and driving all over cities with the Albanian flag in tow. Many reactions were even seen in Facebook pointing to the third raising of the flag in row in Balkans: 1919 in Albania, 2008 in Kosovo and last one in 2014 in Serbia. It was perceived as symbolic victory of Albanians in the Balkans against their long term oppressors. On the other hand, the international media brought the images of the game back to the war. Internationally it shifted the image of Balkan people, from progressing slowly and approaching more European values, be it Albanian or Serbian, backwards to war times, hating each other, bloody, violent, racist and nationalistic, backward people. Thus locally the Albanians are perceived as winners however internationally, both Serbs and Albanians are perceived as losers. What will be the long-term consequences of this match for locals and internationals? Albanians experienced racism, humiliation and mistreatment in the airport (where they were kept locked for many hours), and attacks in Belgrade and other cities even after the game (sporadic attacks of Albanians in their homes was spread over the Serbian territories and political authorities asked to stop it). The match reaffirmed the beliefs that Serbians are not respectful towards Albanians, will always be violent towards them and hence increased and deepened the mistrust between two communities generally. Similarly for the Serbs, the drone was perceived as an attack and a threat towards Serbs, and reaffirmed their beliefs that Albanians do hate them, always will want to take their territory if they can, and hence the mistrust between Serbs and Albanians grew deeper. For the internationals, it brought the image of the Balkans, represented here by Serbs and Albanians, as a nationalistic and backward region with even less of European perspective than they had previously imagined. From now on they might become more cautious in their decision making on the region due to the incident. Thus the Balkans' image internationally has been damaged. For both locals and internationals the match had negative consequences as for the locals the match served to deepen the mistrust between communities and reaffirm their divisive beliefs, whereas internationally it damaged the region’s progressive reputation and image. Thus in long term, the UEFA inaccurate assessment of the political situation to proceed with the match damaged the Balkan countries locally and internationally, perhaps unintentionally. If these countries have not been put into a test, as some peace promoters think to have found the solution of reconciliation after war through football, the image of Balkans would have perhaps survived or not be damaged as prospective European countries. Furthermore the deep animosities might not have resurfaced and a smoother reconciliation would have been set into a path. The match might have done more harm than good in long term to all the countries in the region by deepening local mistrust between communities and reaffirming the stereotype of the backward, blood thirsty Balkan people. Peace and reconciliation between communities takes a long time and the time needs to be given, situations that may include potential provocations between communities [e.g. football match where the perception that a discriminatory policy was being applied only to Albanian fans was created by not allowing them in stadium] should be avoided in order to do less harm in long term. There are many unresolved issues in the region [e.g. Kosovo/Serbia] that can spark such reactions before a peaceful match can be played. In addition, in post conflict countries, even seemingly innocuous events, such as football matches, are political. Perhaps peace and reconciliation may be facilitated through football, however the timing and the local socio-political realities must be taken into account when such UEFA decisions are made in future. As stressed earlier, UEFA unintentionally might have damaged the region in the long term, however they also remain unaccountable for their faulty decision-making and will not be able to undo the harm done. Thus peace making through football too early can be very harmful for everybody involved: UEFA, locals and internationals. Lessons to be learned from this case would be that UEFA, as an inexperienced organization in post conflict situations, should understand, assess and be sensitive to the local/regional context much more when proceeding with matches and have higher security criteria for the host countries in the future - if they wish to remain involved in post conflict zones and provide football for everybody in these areas. They must also seek advice from other experienced local organizations (NGOs, universities, think tanks if they are impartial, or conduct public polls on the sensitivity of the game) and international organizations or regional organizations such as EU when they assess such matches to avoid further mistakes. Lastly, UEFA should open an independent inquiry to bring the facts in the table, in order to avoid further pitfalls and spreading of further misrepresentations in the region. For instance Serbian authorities said that they had suspicions that the brother of Edi Rama, current Albanian prime minister had organized the drone. The President of Albania, Nishani said on the other hand, that he suspected that the Serbian security services planted it. In the end, the organizer of the match is UEFA thus the full responsibility lies with the organization, not the involved states, on whether to proceed with sensitive games and as such they should be able to take all the measures before the game to ensure peaceful play. If there are escalations, they should as well take responsibility, and acknowledge their roles by changing their practices of decision making in the future. Luckily there were no casualties this time, but next time we shouldn't take the chance.